At 95 decibels, the sound of the recently unveiled compostable Sun Chips bag is louder than a jet cockpit. And that’s giving Frito-Lay a lot of free publicity. But is all this hullabaloo necessarily a bad thing for Frito Lay? As the Wall Street Journal points out, the “crunch” factor has long been used as a selling point for Frito Lay products like Cheetos and Doritos–albeit in those cases it’s the chips, not the bags, that offer crunchiness. There’s a scientific reason for the Sun Chips bag’s loudness: the new polymers used in the biodegradable bag has a high glass transition temperature (the temperature when polymers move from a hard state to a rubbery state). That translates into a highly crispy-sounding bag. The truth is, “green” snacking doesn’t have to wake the neighbors to be effective. Unlike the famously loud corn starch-based compostable bag introduced by Frito Lay earlier this year, Boulder Canyon Natural Foods has introduced a fully compostable bag to its kettle-cooked potato chip line that feels and sounds like a traditional bag of chips should. to create. It’s something that we’re looking at,” says Chris Kuechenmeister, Director of Public Relations for Frito Lay North America. 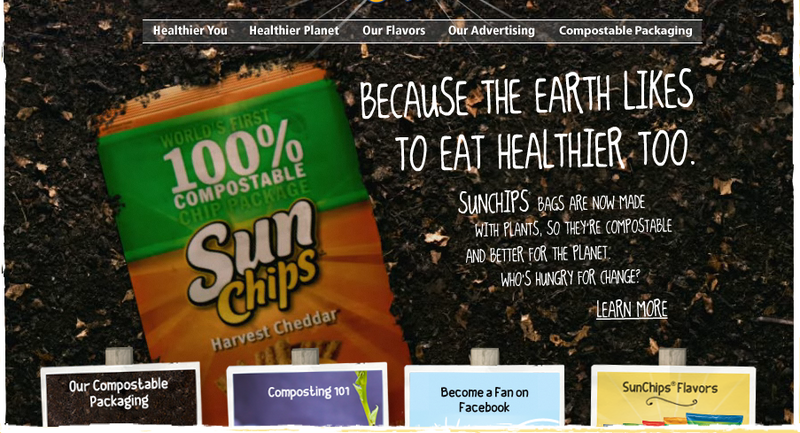 Perhaps the Sun Chips bag’s crunch is all just a marketing ploy. Perhaps it’s just an accident of science. Either way, Frito Lay is getting a lot of free publicity.